The climate of India is a complex phenomenon and is influenced by large number of geographical factors. Some of the important factors are briefly discuss as under. The mainland of India extends roughly from 8°N to 37°N and the Tropic of Cancer passes through the middle of the country. Areas South of the Tropic of Cancer are closer to the equator and experience high temperature throughout the year. The Northern parts on the other hand lie in the warm temperate zone. Areas near the coast have maritime climate. On the contrary, interior locations are deprived of the moderating influence of the sea and experience extreme or continental climate. 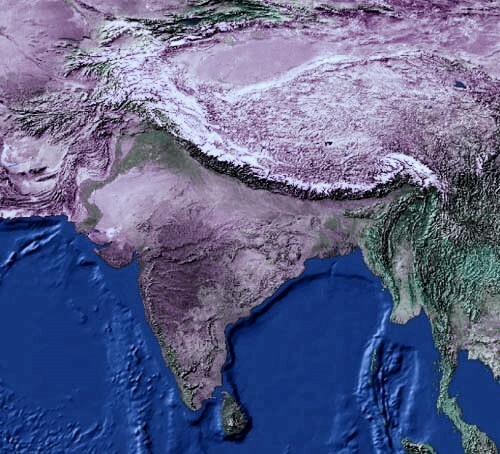 These ranges protect India from the bitterly cold and dry winds of Central Asia during winter and also, act as an effective physical barrier for rain bearing South-west monsoon winds at the northern frontiers of India. Thus, the Himalayan mountain ranges act as a climatic divide between the Indian sub-continent and central Asia. The Physical features influence the temperature, atmosphere pressure, direction of winds and the amount of rainfall in different parts of the country. The complete reversal in the direction of winds in India brings about a sudden change in seasons. The harsh summer season suddenly giving way to the eagerly awaited monsoon or rainy season. These winds have such a far reaching influence on india’s climate that it is termed as monsoon type of climate. The inflow of Western disturbances which move under the influence of westerly jet streams from the Mediterranean Sea influence winter weather conditions over most of Northern plains and western Himalayan region. The tropical cyclones also develop in the Bay of Bengal. The frequency and direction of these cyclones influence weather conditions during South-West monsoons over most parts of India and along the Eastern coast during retreating monsoon season. Weather conditions in India are also influenced by El-Nino which causes widespread floods and droughts in tropical regions of the world. This warming of topical pacific water affects the global pattern of pressure and wind systems including the monsoon winds in the Indian Ocean. It is believed that the severest drought of 1987 in India was caused by El-Nino.